In Noah Barleywater Runs Away, bestselling author John Boyne explores the world of childhood and the adventures that we can all have there. Noah is running away from his problems, or at least that's what he thinks, the day he takes the untrodden path through the forest. When he comes across a very unusual toyshop and meets the even more unusual toymaker he's not sure what to expect. But the toymaker has a story to tell, a story full of adventure, and wonder and broken promises. And Noah travels with him on a journey that will change his life for ever. A thought-provoking fable for our modern world from the author of the bestselling and critically acclaimed Boy in the Striped Pyjamas. "You should never want to be anything other than you are ... Remember that. You should never wish for more than you've been given. It could be the greatest mistake of your life." 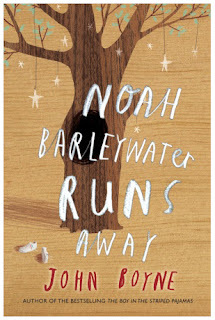 Noah Barleywater Runs Away by John Boyne is a magical work of art. What appears superficially to be just another juvenile adventure book, is, in truth, the most beautiful and deeply touching fairy tale I've had the pleasure of reading in a long time. Noah is an extremely vulnerable and bright young boy, who, at the age of 8, have decided to escape from his home and his parents, in hope of experiencing some great, life-changing adventures. Or, should I say, this is what Noah convinces himself to believe. He tells himself that adventure sounds much better than the real reason for him leaving home. A reason, which he does not even want to think about. And so he decides to go out to "make his own way in the world", to do something meaningful with his life, achieve something impressive. We follow Noah's every move, since the moment he puts on his coat, opens the door and sneaks out of the house. As he runs, Noah enters an enchanting land, straight out of the pages of children's book. He walks into the world of magic, talking animals and moving trees. He meets many interesting individuals along his path, a talking Dachshund, an ever-hungry (and also talking) donkey, an exceptionally short man with a black wig.. And then he reaches a mysterious toy shop, full of hand-crafted wooden toys. Inside the store he finds whispering puppets, doors that move and speak, a floor that shifts and moves around, to make up for the deficiency of floorboards, and many, many other extraordinary things. He also meets a strange and enigmatic man, who invites him in for lunch and tells him the story of his life. As these two talk, we learn more and more about both the elderly man, and Noah, and we begin to understand the real motivation behind Noah's escape. The story comes to a surprising and heart-breaking conclusion, that left me speechless. I was deeply moved by this book and impressed with John Boyne's fabulous writing style. The novel addresses many awfully important issues of both childhood and adulthood, like friendship, bullying, loss of someone close to us and ways to deal with it, broken promises, aging and inevitability of death, importance of facing and overcoming our fears, being there for each other in times of need and making the most out of the time we have with our families. The profound depth of this story and rare sensitivity with which it's told, unforgettable characters, spellbinding encounters and deeply moving conclusion will no doubt make this story resonate with readers of all ages. I myself will make sure that my children will grow up reading this wonderful book. 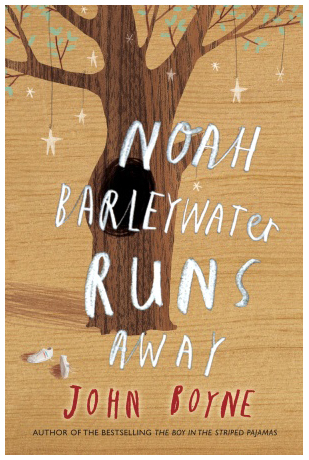 Noah Barleywater Runs Away is not just any book, it's a sparkling gem among children's novels. Meaningful and memorable, it will no doubt have a special place in your heart. I highly recommend buying a copy for yourself, it's not only a must-read, but definitely a must-have, too! How could I not want to read this book after your awesome review! It sounds like such a beautiful story, I will definitely be ordering a copy! Wow, it seems like a touching book. Also has me interested. Great review! I heard about this one a while ago and felt sort of apathetic, but after reading more about it in your review I really want to get my hands on it! I've read the boy in the striped pj's so I know how great the author is. I absolutely adore a good childrens story (especially the fairytale sort) so i'm really excited about this one now! totally on my TBR list. I won a copy of this book a few weeks back and I haven't been able to start it yet. I am thinking I might move it up towards the top of my TBR pile after this review. I am hoping my children will really love it. Thank you for the excellent review, I look forward to reading this so much! I adore books that take you back to childhood like that! Thanks for sharing! I'll have to add this to my TBR pile! Great review on it. First time hearing about this book but it does sound great. Wow, I am impressed that your review lets a children's book, a fairy tale sound so interesting. The issues being featured like friendship, death etc. are truely important to talk(write-read) about. Great review! I also read and reviewed Noah Barleywater, but yours is much more eloquent. The first paragraph sums up the feel of the book perfectly. Oh gosh. Just reading any review that a certain book is heartbreaking is enough for me to give reading it a try. A magical work of art is definitely something I would enjoy reading. I liked the book trailor too! A great review. I love that fairy tales and fables are timeless and can be loved by people of any age! When my friend read this book, she described it as incredibly emotional and touching, and your review sounds spot on. This book has been on my to-read list for a while, and it just sounds like this incredible, profound story with important themes, and amazing characters. I can't wait to read it! Your review was so good! I must read this book and recommend it to my little sister asap!